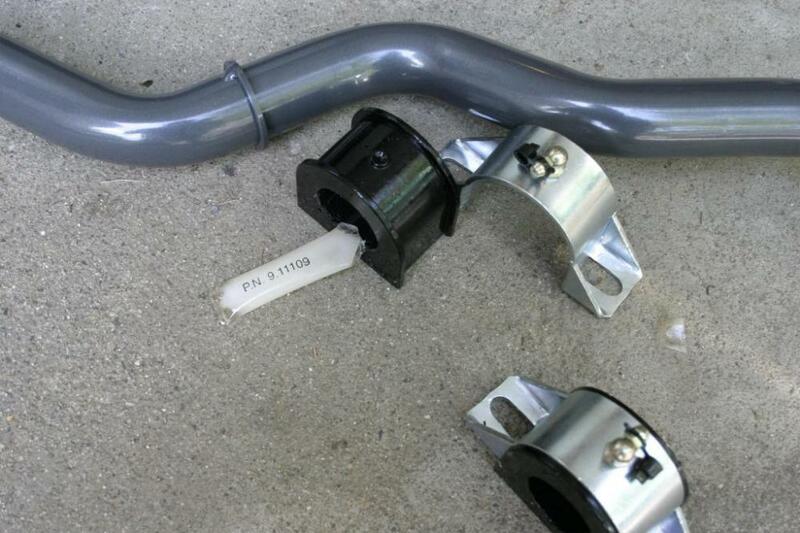 This DIY describes replacing the front sway bar (stabilizer bar). 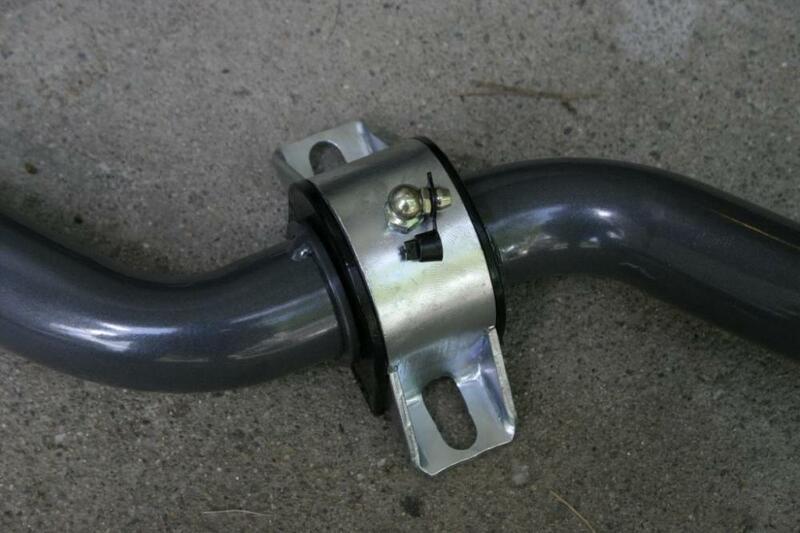 For the rear sway bar see here. 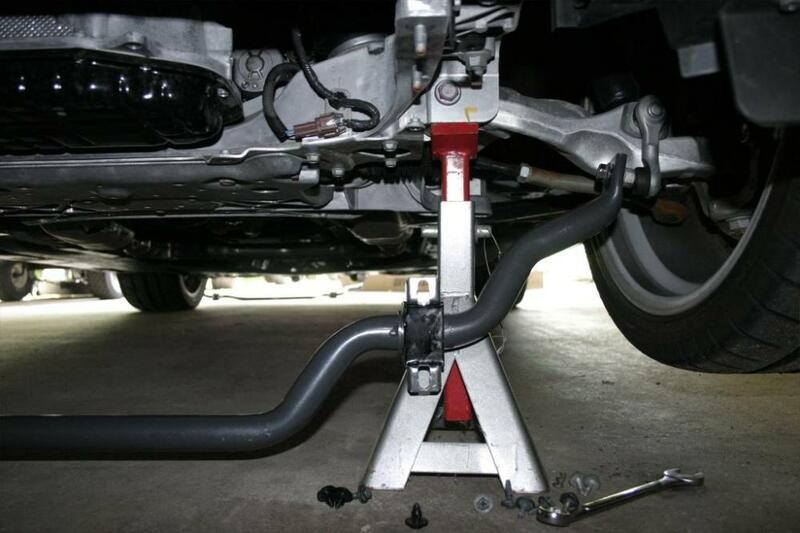 Jack front of car and support securely with jack stands. It is not necessary to remove the wheels but you do get better access. 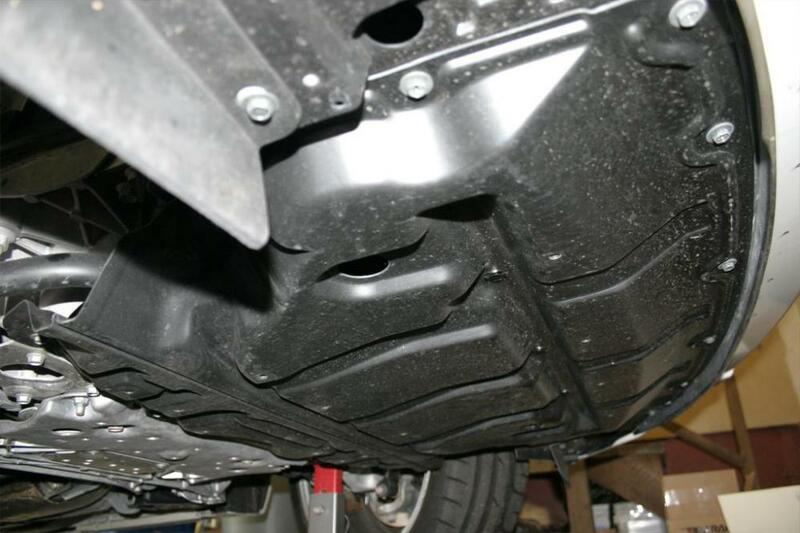 Remove undertray bolts using a 10mm socket (with optional electric driver). Remove plastic clips by popping center out with small flat screwdriver or finger nails. 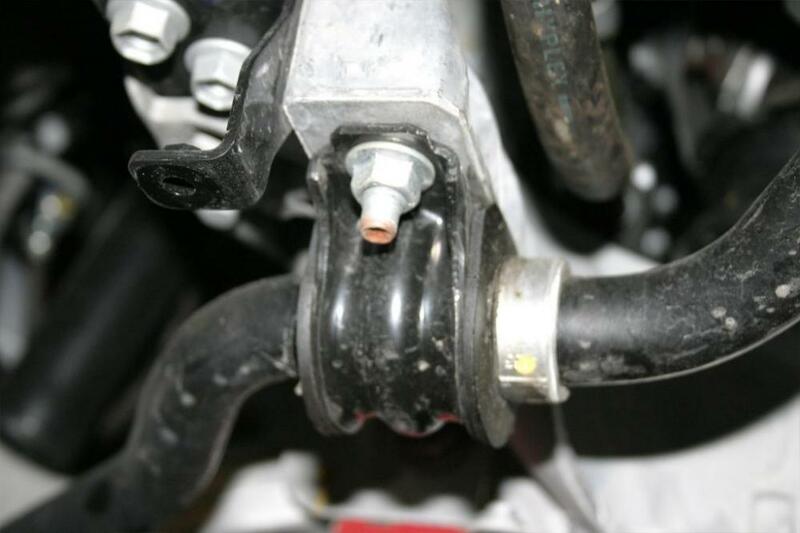 Locate the end of the sway bar and loosen the end links with a 17mm socket or wrench. Leave loosely attached for now. 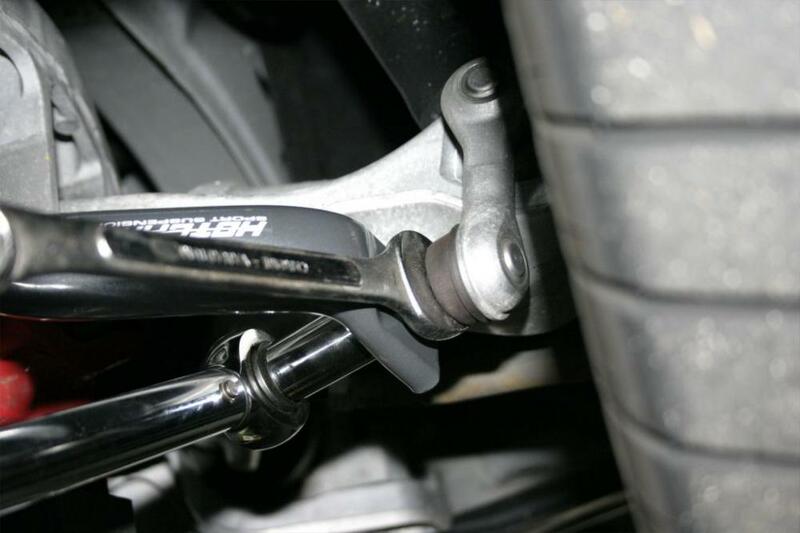 Remove the sway bar clamps with a 14mm socket. 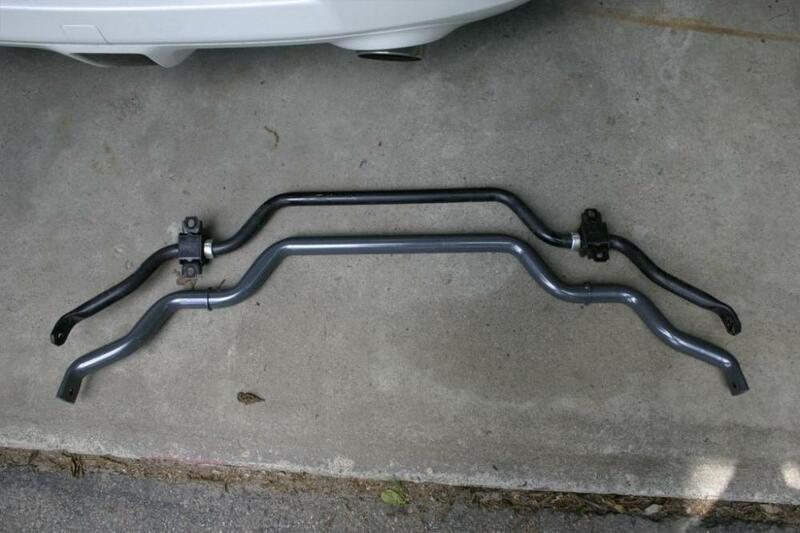 Let the sway bar swing down. Disconnect the end links and remove the bar. Preparing new bar by greasing the bushings. Slide rubber bushing over bar and then add the clamp. Installation is a reversal of the removal procedure. kenchan, njustidokite, rhd and 5 others like this. Last edited by ChrisSlicks; 06-01-2009 at 08:01 PM. nice DIY, have any pics to illustrate this better?? You don't see pics? Oops. The pics are there for me, I'll see if I can fix. Edit: should be fixed now. how does the ride feel now?? more stable at taking corners?? have you tried a hard turn with it on?? 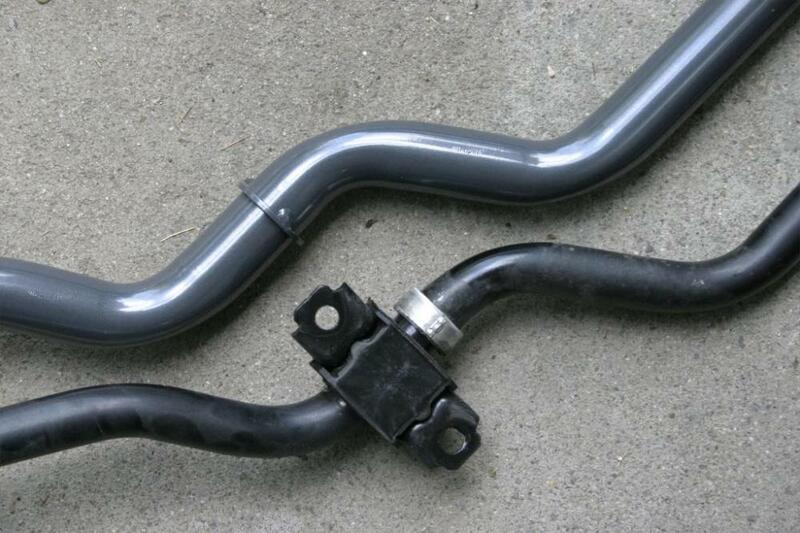 The stiffer sway bars make a HUGE difference. I strongly recommend to all to enjoy anything from nice back roads to track time. Any chance you got the weight of the new versus old? Are you planning to replace the one in the rear? It feels a lot flatter in the corners. There is a down side however, it is now harder to load a corner of the car which may result in some unexpected turn in understeer. I'll be putting it to the test tomorrow with an auto-cross session. I didn't measure them, but the new one is significantly heavier by probably 50%. I would guess that the old front was about 15 pounds, and the new front is around 23. Rear install is complete, guide coming up. Yes, these are the Hotchkis. Got to test them out today at the auto-cross so I can give you guys some feedback. The car feels a lot flatter in the corners but now has a little more turn-in understeer. Honestly I think the front bar is a little too large, something inbetween this and the stock is probably what we really want, at least for auto-cross style driving. At the track I think the bar setup might be okay as you usually don't have to aggressively transfer weight to the front corner. The car did feel more settled in higher speed slaloms. They really need to come out with a front bar designed for the Z rather than just assuming that the G37 will work good enough. Alright, thanks for the feedback, hopefully they'll come out with a specific one soon! Anyone knows if the Stillen one is different from their G37 one? Their PDF instructions still say G35 on them. Nice DIY. I suggest you guys wait on Hotchkis to develop better sways or buy another brand who doesn't have that stopper welded on the bar. That weld joint creates a high stress concentration and possibly small cracks which could fail due to creep, which was exactly what happened to my last pair of Hotchkis. Nice DIY again, just did mine. Only discrepancy: I don't think both sides of the end-link are 17mm, at least they weren't on my car. 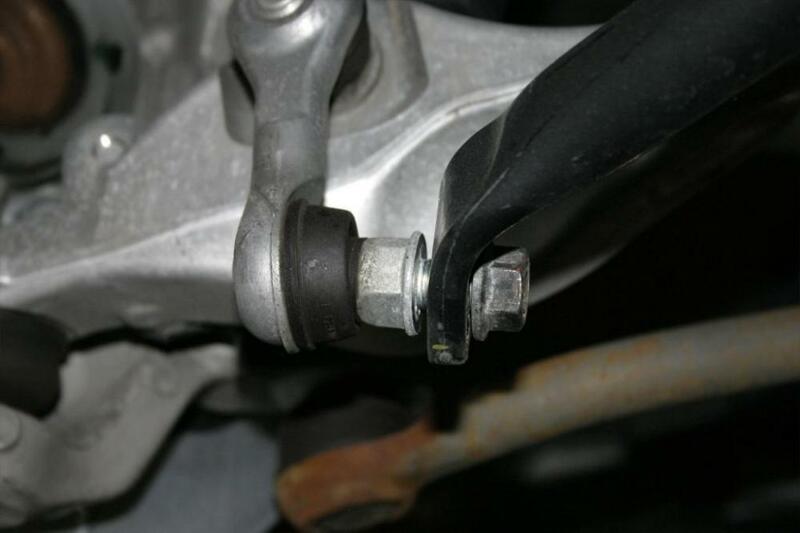 The nut you remove is 17, but the rear part you hold with an open wrench is larger, probably 19mm. I only had up to 18mm in open wrenches (at least that I could find), which also didn't fit over it, so I just opted for an adjustable wrench. how much did you pay for the set? if you don't mind. they look great btw.